This name uses Eastern Slavic naming customs; the patronymic is Nikitich and the family name is Khrushchev. Khrushchev holds several advanced engineering degrees. From the Ukrainian Academy of Science, he earned his doctoral degree, and he earned a Ph.D. from the Moscow Technical University. In addition, he earned an M.A. degree with distinction from the Moscow Electric Power Institute. He also holds an "occasional" professorship at the Naval War College in Newport, Rhode Island, meaning he is not a full-time professor (though he was for some time), but does teach there fairly often. Prior to emigrating from the Soviet Union to the United States in 1991, Khrushchev worked in various high-level engineering positions. From 1968 to 1991, he served at the Control Computer Institute in Moscow, where he rose from section head to first deputy director in charge of research. From the years 1958 to 1968, Dr. Khrushchev worked as an engineer, then later as a deputy section head in charge of guidance systems for missile and space design. In this capacity, he worked on cruise missiles for submarine craft, military and research spacecraft, moon vehicles, and the "Proton" space booster. He often speaks to American audiences to share his memories of the "other" side of the Cold War. Khrushchev serves as an advisor to the Cold War Museum. He was a Senior Fellow at the Watson Institute for International and Public Affairs at Brown University. On July 12, 1999, he and his wife, Valentina, became naturalized citizens of the United States. 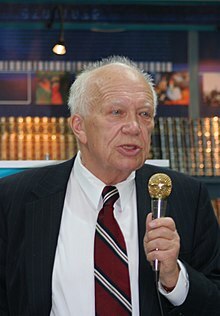 Sergei's son from a previous marriage, Nikita Sergeyevich Khrushchev, a Russian journalist, died on February 22, 2007, aged 47, from a stroke. He has another son, whose name is also Sergei. ^ Kerlin, Janet. "Sergei Khrushchev will take oath of U.S. citizenship on July 12". Brown University News. Brown University. Retrieved 15 June 2015. Wikimedia Commons has media related to Sergei Khrushchev.